A research team including a Scripps Institution of Oceanography at the University of California San Diego climate scientist simulated in a computer model, for the first time, the realistic evolution of global mean surface temperature since 1900. In doing so, the researchers also created a new method by which researchers can measure and monitor the pace of anthropogenic global warming, finding that the contribution of human activities to warming in the surface waters of the Pacific Ocean can be distinguished from natural variability. "The climate system includes naturally occurring cycles that complicate the measurement of global warming due to the anthropogenic increase in atmospheric greenhouse gases," said Xie. "We can isolate the anthropogenic warming by removing the internally generated natural variability." Climate policymakers have sought to limit the rise of global temperatures to 2° Celsius higher than pre-industrial levels. That figure is considered a threshold beyond which society and natural systems are virtually assured of experiencing significant and dangerous instability. Scientists have estimated that the planet is already roughly 1° C warmer at the surface than before the Industrial Revolution. The 2° C target was reaffirmed during the 2015 Conference of the Parties, known as COP21, that was held in Paris in December. Kosaka and Xie's research could provide an easily generated and more accurate means to measure society's success in keeping temperatures below that threshold. The research is further confirmation of the primary importance of the Pacific in controlling global-scale climate that researchers have come to understand in recent decades. Kosaka and Xie plotted the rise of global mean temperatures over the past 120 years. The rise of temperatures ascends in a staircase fashion with the steps becoming larger over the past 50 years. When Kosaka and Xie removed as a variable the natural warming and cooling of the Pacific Ocean, the rise of global mean surface temperature became a more linear increase, one that began to accelerate more sharply in the 1960s. It had been natural Pacific decadal variations that temporarily slowed down or speeded up the warming trend, leading to the staircase pattern. 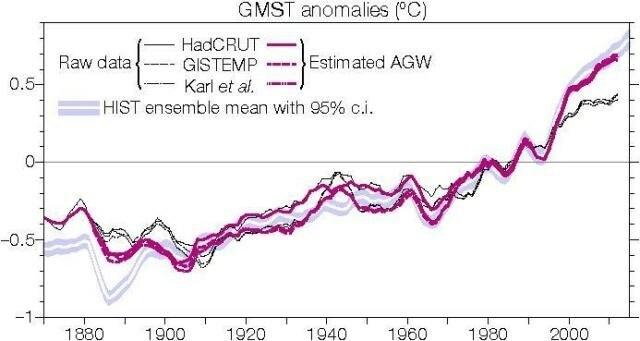 For example, global mean surface temperature has not changed much for 1998-2014, a time period known as the hiatus that has been tied to naturally occurring tropical Pacific cooling. Raw data show a warming of 0.9° C for the recent five-year period of 2010-2014 relative to 1900 while Kosaka and Xie's calculation yields a much higher anthropogenic warming of 1.2° C after correcting for the natural variability effect. "Most of the difference between the raw data and new estimates is found during the recent 18 years since 1998," said Xie. "Because of the hiatus, the raw data underestimate the greenhouse warming." Kosaka and Xie suggest that though Pacific Ocean trends are an essential variable control on global temperature rise, the accuracy of their warming estimate will be improved in the future as other climate modes are added as variables. An international initiative involving more than a dozen climate models is being planned to improve the estimates included in upcoming assessments by the Intergovernmental Panel on Climate Change (IPCC).